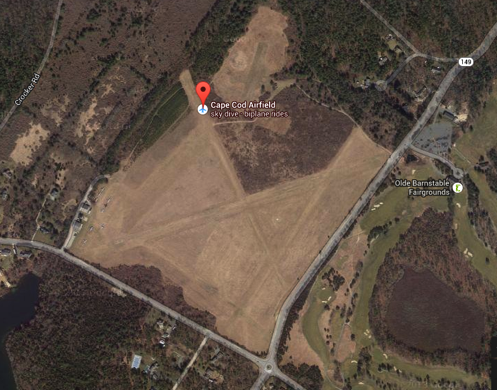 Cape Cod Airfield offers a variety of services for pilots, fuel, maintenance, and tie downs (over night or long term). 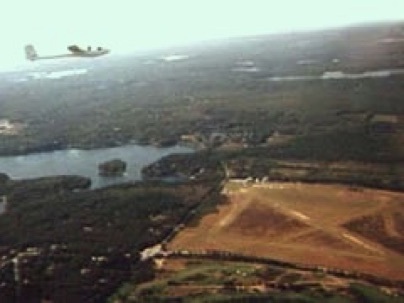 On the right is a Google map view of the airfield. You can link to a live Google map here. See the complete and most recent pilot information from AirNav.com. • CLNC DLVY THRU BRIDGEPORT FSS (BDR) 1-866-293-5149. PLYMOUTH 135/20.4 257 16W FFF ..-. ..-. ..-. PROVINCETOWN 215/24.4 389 16W PVC .--. ...- -.-. MARSHFIELD 170/27.6 368 16W IMR .. -- .-. TAUNTON 129/29.8 227 16W TAN - .- -. BE AWARE OF HI-SPEED MILITARY JET & HEAVY HELICOPTER TFC VCNTY OTIS AFB. BE ALERT FOR RADIO CONTROL AIRPLANES NE CORNER AIRFIELD. BANNER TOW OPS IN PROGRESS JUN THRU AUG NORTH SIDE OF AIRFIELD. GLIDER TOW OPNS DURG DALGT HRS. PPR REQUIRED FOR RY 05/23 OPERATIONS. There are no published instrument procedures at 2B1. ** Information above has been copied directly from the Air/Nav website, we are not liable for mistakes that might be made in the above information. For the most up-to-date and comprehensive information please visit the Air/Nav website.